From the early years of Nippon Kogaku K.K. alias Nikon Corporation scientific photography was a serious concern of the engineers in Tokyo. Actually Nikon was staffed with practical and gifted engineers without any commercial interests. Perfection was more important than selling. Apart from making equipment for amateur and professional photographers, Nikon made and still makes instruments for scientists and researchers. The items listed here are interesting cameras made exclusively for photography via microscopes etc. They have no exposure metering programs, no aperture coupling mechanism, no focusing features, no shutter (some do have a shutter), no viewfinder. Just a camera body with a LTM (Leica Thread Mount) = 39 mm. or with the Nikon F-mount. The ´shutter´ is a manual slide for (long) time exposures. The first versions have manual film advance, the modern versions have a motor drive and even a possibility to imprint data on the film via a data back. 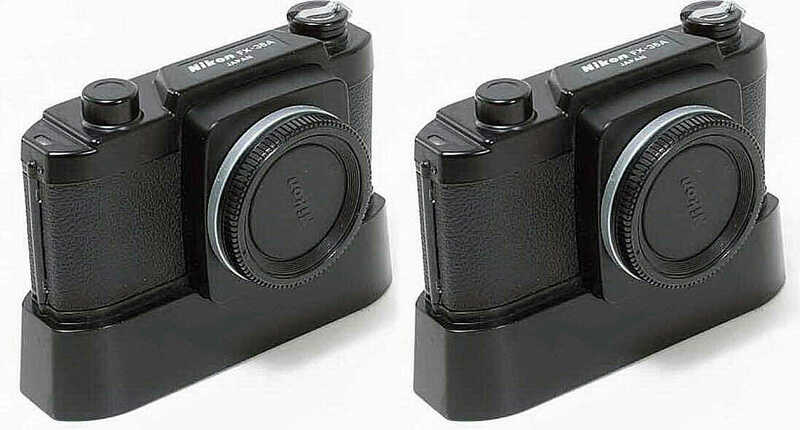 On the basis of the Nikkorex SLR series Nikon introduced in 1967 the Nikon/Nikkorex M-35 and some years later the Nikon/Nikkorex-35S microscope cameras. Both cameras have neither a built-in shutter, nor a viewfinder, exposure meter and a motor drive. The M-35S has the possibility to make images on full format (24 x 36 mm.) or half format (24 x 18 mm.). Via adapters these cameras can be used on a variety of microscopes. The two cameras shown above are based on the Nikon EM. The FX-35 has no shutter, no exposure meter, no viewfinder and no motor drive. It can be used on the Microflex AFX-II and PFX. 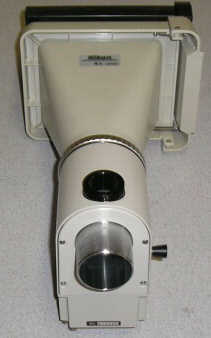 Film transport is done manually and the Microflex equipment has a built-in shutter and exposure meter. The FX-35A has as an extra built-in motor drive. 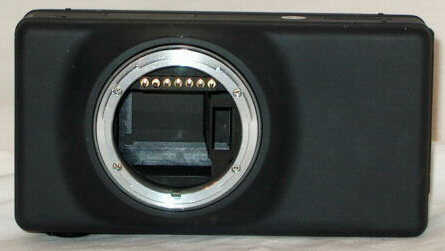 It can be used on the Microflex UFX-II and HFX-II, which have built-in shutters and exposure meters. The Nikon FX-34A-DATA has a built-in shutter and a data back. It is also possible to exchange the back with a polaroid back. In the era of computers, electron microscopes and digital photography Nikon made equipment, or at least connections and attachments for scientific and industrial photography. Many regular older and modern Nikon film, movie, video and digital cameras can be connected to all kinds of micro/nano instruments. It is unfeasible to list all equipment Nikon has ever made and still produces, as Nikon Corporation has separate sales and export departments for special equipment. Interesting to know that Nikon Corporation is present in most markets where image registration is needed, but in the framework of this web site difficult to give an overview. Nevertheless for special photography related equipment or items see here for a limited review of special Nikon equipment, which is not available via your regular Nikon dealer.